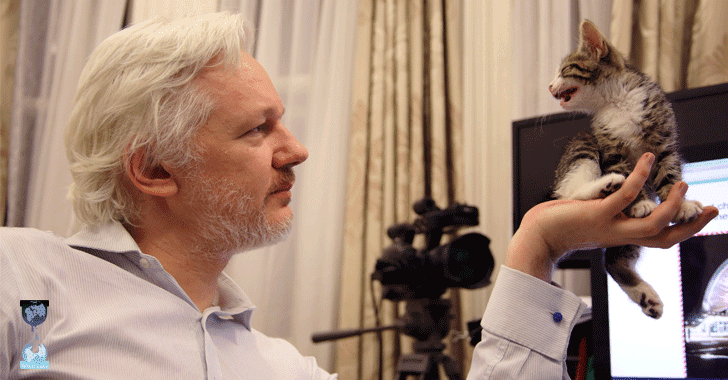 Don't worry — Julian Assange is alive and kicking! But his Internet connection is dead. Earlier today, Wikileaks tweeted that its co-founder, Julian Assange, had his internet connection intentionally cut by an unidentified "state party." The non-profit organization said it had "activated appropriate contingency plans," giving no further explanation. 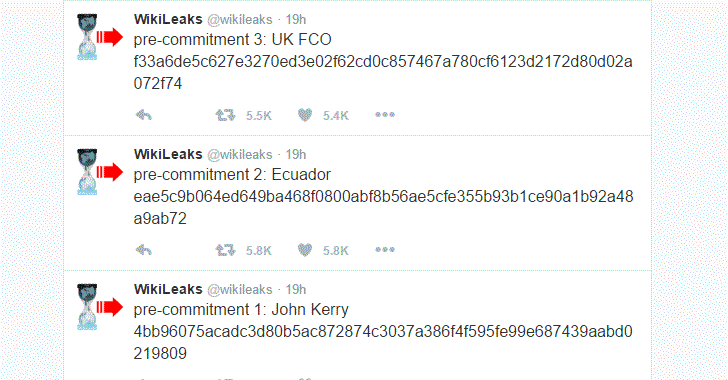 The tweet came after Wikileaks posted a series of three cryptic tweets, each containing a 64-character code. In no time, the tweets sparked bizarre rumors that Julian Assange has died. The tweets referenced Ecuador, Secretary of State John Kerry and the United Kingdom's Foreign Commonwealth Office. What exactly are those Mysterious Wikileaks Tweets? Some users on Twitter, Reddit, and various discussion forums speculated that the tweets in question were the result of a "dead man’s switch" that has been triggered in the event of Julian Assange’s untimely death. Users on Twitter and Reddit suggested that these tweets include encryption keys to the highly classified secret documents that should be revealed in the wake of his death. However, these rumors were ended by WikiLeaks' volunteer Kelly Kolisnik, who tweeted, "Julian Assange is alive and well. Rumors circulating that he tweeted out a "Dead Man's switch" are completely false and baseless." Kolisnik even tweeted out some photos of them together. Moreover, a Reddit user suggested that the tweets included "hashes" that would be used to ensure that information leaked by WikiLeaks in the future is authentic. "WikiLeaks is tweeting out hashes. They're not passwords to unlock a file, but a digital fingerprint to prove its authenticity." Also, these 64-character codes are likely for "pre-commitment," a practice in cryptography to provide proof that any unreleased documents have not been tampered with. Like in this case, any future WikiLeaks download of documents involving Secretary of State John Kerry will possibly contain the 'Pre-commitment 1' tweet code as proof of their authenticity. Who's Wikileaks' Next Target? John Kerry? The first WikiLeak 'pre-commitment' tweet has mentioned John Kerry, the Democratic Party politician who is the current United States Secretary of State. So, it's likely that Wikileaks is about to release Kerry's emails, following its publication of troves of hacked emails from Democratic National Committee (DNC) documents in July and, most recently, emails from Hillary Clinton’s campaign manager John Podesta. Even former Trump advisor Roger Stone, who is known for his outspoken comments, recently tweeted that "John Kerry has threatened the Ecuadorian President with ‘grave consequences for Ecuador’ if Assange is not silenced." Stone also added that "Reports the Brits storm the Ecuadorian Embassy tonite while Kerry demands the UK revoke their diplomatic status so Assange can be seized." Many users from the various online forum have been connecting Assange’s alleged internet severing with WikiLeaks' recent release of sensitive material about Hillary Clinton’s campaign for president. And like previously, Clinton’s team has suggested that WikiLeaks is working with the Russian government to assist Donald Trump, suggesting that the United States government is the "state party" behind the recent act.